Amaranthus caudatus agglutinin or amaranthin is a lectin from the ancient South American crop, amaranth grain. Although its biological function is unknown, it has a high binding specificity for the methyl-glycoside of the T-antigen, found linked to serine or threonine residues of cell surface glycoproteins (PUBMED:2271665). The protein is comprised of a homodimer, with each homodimer consisting of two beta-trefoil domains (PUBMED:9334739). Agglutinins are sugar-specific lectins that can agglutinate erythrocytes and other cell types. Lectins occur widely in plants, as well as some microorganisms and animal [(PUBMED:15229195)]. Agglutinin from Amaranthus caudatus (amaranthin) is a lectin from the ancient South American crop, amaranth grain. Although its biological function is unknown, it can agglutinate A, B and O red blood cells, and has a carbohydrate-binding site that is specific for the methyl-glycoside of the T-antigen found linked to serine or threonine residues of cell surface glycoproteins [(PUBMED:2271665)]. The protein is comprised of a homodimer, with each homodimer consisting of two beta-trefoil domains [(PUBMED:2777780)]. Lectin B chains from ricin and related toxins also contain beta-trefoil domain, however they are not related to agglutinin, showing little sequence similarity [(PUBMED:9334739)]. There are 21 Agglutinin domains in 9 proteins in SMART's nrdb database. Taxonomic distribution of proteins containing Agglutinin domain. This tree includes only several representative species. The complete taxonomic breakdown of all proteins with Agglutinin domain is also avaliable. Click on the protein counts, or double click on taxonomic names to display all proteins containing Agglutinin domain in the selected taxonomic class. 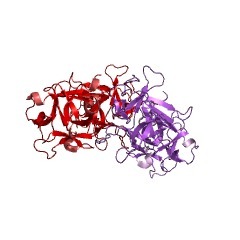 Structure of benzyl T-antigen disaccharide bound to Amaranthus caudatus agglutinin. Amaranthus caudatus agglutinin contains a novel arrangement of four beta-trefoil domains. The sugar-binding site provides specificity for the carcinoma-associated T-antigen disaccharide even when 'masked' by other sugars. Physicochemical properties of amaranthin, the lectin from Amaranthus caudatus seeds. Amaranthin is the lectin present in the seeds of Amaranthus caudatus, which specifically binds the T-disaccharide (Gal beta 1,3GalNAc alpha-O-). The lectin is composed of a single type of subunit with Mr = 33,000-36,000 (Rinderle et al., 1989). Equilibrium sedimentation (Mr = 62,900) and low-angle laser light scattering (Mr = 61,400) methods have been used to unambiguously establish the native multimeric structure of amaranthin as a homodimer. These absolute molecular weight methods and the calculated Stokes radius (27.2 A) indicate that the amaranthin dimer is highly compact relative to typical globular proteins, and thus, anomalous molecular weight values are obtained when simple size exclusion chromatography is used to determine the molecular weight of amaranthin. 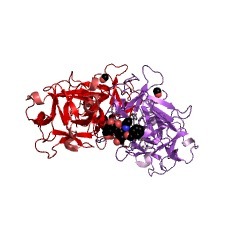 Studies with a homobifunctional cross-linking reagent and amaranthin further support the existence of a lectin homodimer. The stoichiometry of carbohydrate binding was determined to be one T-disaccharide-binding site per amaranthin subunit (Ka = 3.6 X 10(5) M-1). Amaranthin exhibits hydrophobic-binding properties as indicated by binding of 8-anilino-1-naphthalene-sulfonate (Ka = 3.6 X 10(3) M-1) and 6-toluidinyl-2-naphthalenesulfonate (Ka = 2 X 10(4) M-1). Serological studies suggest that amaranthin does not appear to be present in the stems or leaves of the A. caudatus plant, nor were there any indications for the presence of cross-reactive material.